Flames danced atop a tall menorah Tuesday evening at J Space, the Chabad Community Center, in celebration of the start of this year's Festival of Lights, or Hanukkah, which continues through Dec. 28. About 100 students from the J Space Hebrew School and members of the local Jewish community gathered in front of the Ketchum Street building to watch Rabbi Yehuda Kantor light the menorah on the first day of the eight-day festival. 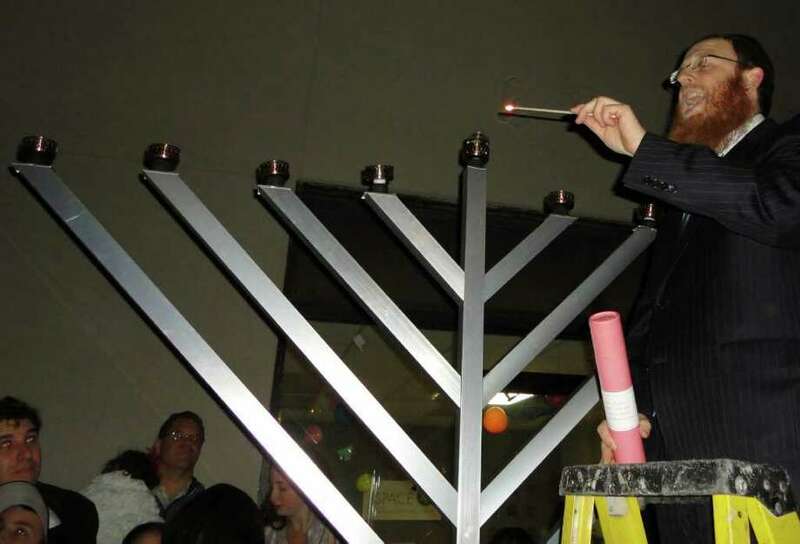 Kantor, the rabbi for Chabad Lubavitch of Westport, which serves the communities of Westport, Weston, Wilton and Norwalk, ascended a ladder to light the menorah, explaining first that Hanukkah commemorates a time 2,200 years ago when Jews lit a menorah with only a day's supply of oil that miraculously burned for eight days. After Kantor lit the menorah, the crowd sang a traditional Hanukkah song, "Maoz Tzur," accompanied on keyboard by Edan Leshem, 10, of Westport. "It makes me feel kind of proud. I was playing piano for my religion and I liked when everyone was singing along," Edan said, admitting he was a little emotional in that moment. Inside the center, people ushered in the holiday by feasting on doughnuts and latkes, while outside fire juggler Jason Pipitone dazzled children and adults with his skills, which include "eating" a flaming torch. Shira Abramson, of Brooklyn, N.Y., a third-grade teacher at the Hebrew School, explained the significance of eating doughnuts and latkes. "They are special because they are fried in oil. It's customary foods that are eaten to commemorate the oil lasting for eight days," Abramson said. "It's license to eat fried foods -- not only license, mandate," one person joked. Many Jewish families have menorahs at home that they light each night of the holiday, but those who attended the event at J Space said they enjoyed the sense of community. "Celebrating as a community magnifies the joy of the tradition, and having the children celebrate together forms the next generation of Jewish Community," said Karen Beckman of Westport.